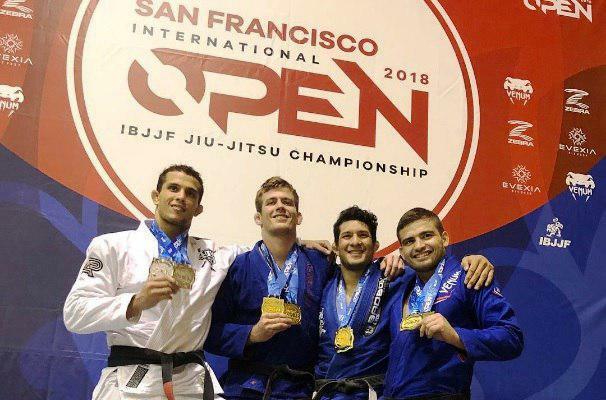 The IBJJF San Francisco Open on Sunday saw the convergence of four Atos black belts who managed to completely shut out the opposition when it came to the absolute (openweight) division. Keenan Cornelius, Gustavo Batista, Lucas Barbosa, and Rafael Vasconcelos were situated in opponent corners of the 12-man bracket. By each winning at least one match (Batista and Vasconcelos both had to win two) they closed out in the semifinals, deciding among themselves who gets which medal. Michael Lieira Jr. took middleweight gold. Lucas Hulk pulled an amazing feat as he beat the medium heavyweight field one day after shining at the Mexico City Open more than 3,500 km away. Keenan Cornelius nabbed gold at heavyweight and closed out the absolute final with Rafael Vasconcelos, with Gustavo Braguinha and Lucas Hulk coming in third. In the end, the Atos team, led by Andre Galvao, had won seven out of 13 possible gold medals and completely covered the podium of the men’s absolute division.